Couscous is simply dry pasta crushed into tiny pieces. So it is not that special grain that grows out of the plant like that. It is made the same way as other pasta: spaghetti, macaroni etc are made from durum wheat, that wheat used in making semolina flour that we use to make Semolina Fufu. Couscous is usually a hard one to prepare. Some people complain about the texture while others complain that it is bland or tasteless. For the texture, once you follow the preparation directions below, the couscous will come out as standalone grains not mushy. For the taste, again if you follow the directions below, you will love the resulting delicious vegetable couscous. Watch the video below for best results. As you can see in the plate above, I served the couscous with Chicken Balls and a Vegetable Sauce. 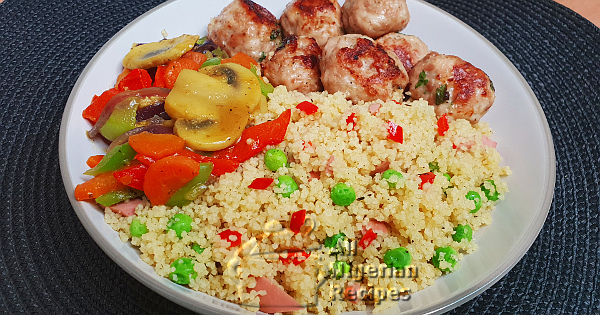 So I will list 3 sets of ingredients below for Vegetable Couscous, the sauce and the Chicken Balls. For the recipe for the full option version of this vegetable sauce, click here. Please note that this vegetable sauce is optional. It is perfectly ok to serve just the couscous and the chicken balls. They both taste great together. You can use either whole wheat couscous or plain couscous. Whole wheat couscous is more nutritious than plain couscous just like brown rice is more nutritious than white rice. I would say have 1 litre of chicken stock before you start preparing this meal. I never measure the stock I add, you will see how I get the perfect quantity in the directions. Chicken Stock adds a lot to the taste of the couscous. I recommend using homemade chicken stock with hen (hard chicken or gallina) Click here for how to make yours. Hotdogs also add a lot to the taste of the couscous. If you do not like hotdogs, use cow liver. I did not even use up one sweet pepper (fresh paprika) in the making of every thing on this page. You can also use Nigerian tatashe as alternative. For these Chicken Balls, great alternatives to fresh parley leaves are fresh basil or Nigerian curry leaves. When using fresh basil chop them up a bit because the leaves are broader. Dice the peppers, hotdogs and half of the onion. Slice the other half of the onion. Slice the mushrooms. See the video below. Place the chicken mince in a clean bowl. Add salt, mixed seasonings and onion powder. Massage with your hand till everything is well combined. Add the parsley or any other alternative you are using. Mix till evenly distributed within the chicken mince. Mold into small balls and place in an oven tray. Bake in a preheated oven for 180 deg Celsius (350 F). While baking, turn them around from time to time so they cook and brown evenly. You can also shallow fry them in a frying pan. The chicken balls should be ready in about 30 minutes. When the chicken balls are about to get done, set the chicken stock on to stove to boil. Put the couscous into a clean bowl. Add the green peas, salt, mixed seasonings, onion powder, diced hot dogs ans diced sweet pepper. Mix everything with a spatula. When the chicken stock boils, pour into the bowl of couscous and ingredients till the chicken stock covers the ingredients by about 1 centimetre or half an inch. Stir with a spatula and cover with a plastic film. set it aside to absorb all the chicken stock and swell up. Set a small quantity of chicken stock in a pot, set on the stove and bring to a boil. When it boils, add the chopped onions, carrots, mushrooms and curry powder, cover and continue cooking. After 3 minutes, add the sliced onions, red and green pepper, salt (if necessary) and more chicken stock if it is drying up. Cover and once it boils again, it's done! Remember to keep checking the Chicken Balls, once they are well cooked, you can take them out. You can continue baking and turning them around till they are golden all over but that's not necessary. Serve all of them as shown in the photo above. delicious!